Landlessness is a major cause and effect of poverty in rural areas. In Bhutan, majority of the rural people depend on agriculture and agriculture related activities to sustain their livelihoods. In some areas, the poor are more vulnerable to chronic poverty due to their dependency on sharecropping and inadequate land. Such conditions make land ownership and control essential in efforts to reduce poverty. Given the apparent linkages between land and poverty, the distribution of land to landless is of fundamental importance in the efforts to alleviate poverty. Integral to efforts towards improving the living standards of the poor, His Majesty the Fourth Druk Gyalpo granted Kidu to the landless, near landless, and households dependent on shifting cultivation (tseri/pangzhing) under the resettlement program which commenced in 1997. Since then, nine phases were implemented in five Dzongkhags namely Dagana, Samdrup Jongkhar, Tsirang, Sarpang and Samtse resulting in the resettlement of 4,600 households. His Majesty, Druk Gyalpo has initiated the new process of taking kidu to the people through office of Gyalpoi Zimpon (OGZ) and its regional offices. A distinct feature of this new process is its proactive approach, wherein the OGZ identifies and verifies the landless through the Dzongkhag/Gewog Kidu Coordinators for land grants. The National Rehabilitation Program was instituted in 2011 under NLCS mainly to rehabilitate landless and socio-economically disadvantaged communities. Increasing the productive asset base of the beneficiaries by providing adequate land and other complementary supports. Creating and enhancing income generation opportunities. Providing necessary socio-economic facilities and services to enable beneficiaries to improve and sustain their livelihoods. 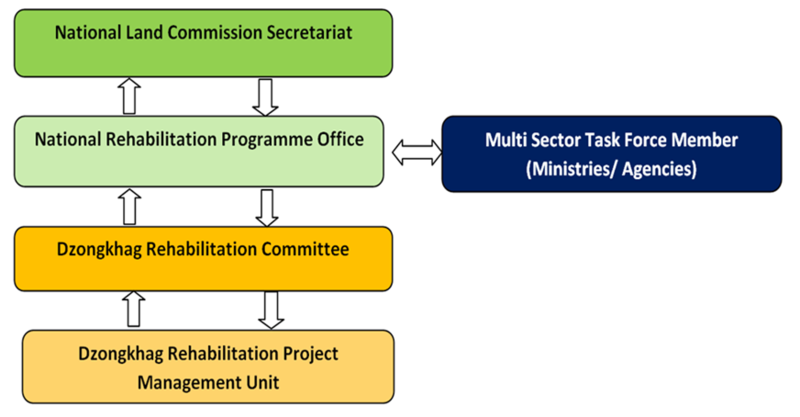 Develop Work Plan for the National Rehabilitation Program. Spearhead identification of potential sites in consultation with Dzongkhag. Facilitate in conducting feasibility studies engaging MSTF members of various Ministries/ Agencies. 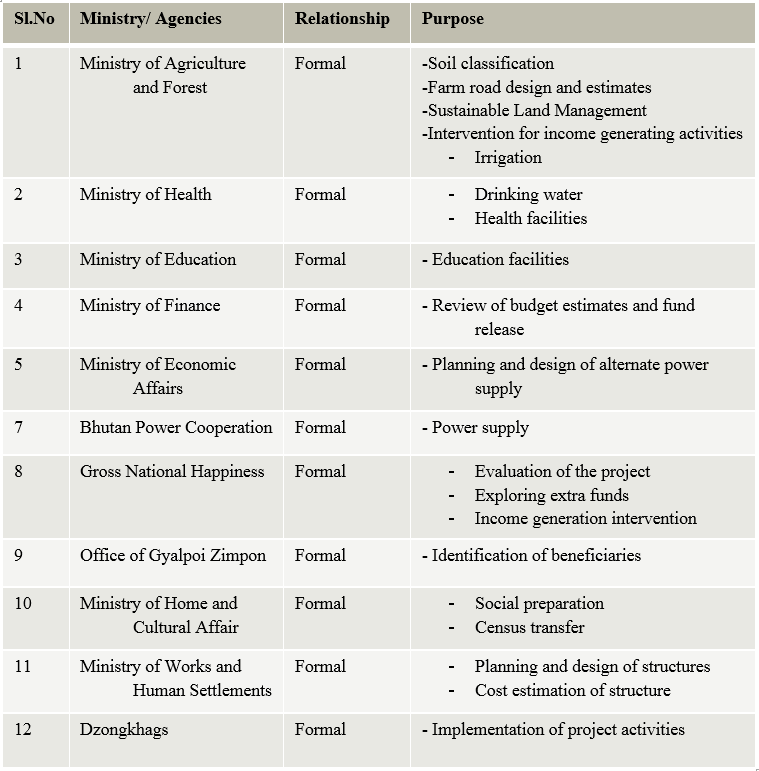 Review implementation plan and budget proposal submitted by Dzongkhag Rehabilitation Project Management Units (DRPMU) and process for approval. Review of housing designs prepared by MoWHS for implementation of structures. Prepare and endorse the quantity with type of materials and other forms of support for housing. Review deviations, if any, in the implementation of rehabilitation activities and take appropriate action. Coordinate and collaborate with relevant agencies for specific technical inputs. Guide and facilitate the DRPMUs in carrying out their functions. Monitor implementation of NRP activities. Develop the National Rehabilitation Strategy (NRS). Review and revise the NRS as and when deemed necessary. Sensitize stakeholders on the NRS. Provide inputs in planning, design, and preliminary cost estimation of Rehabilitation Projects. Assist and facilitate in the development of livelihood supporting interventions. Rehabilitate landless (farmers, retired armed force and civil servants) and socio- economically disadvantaged communities. Spearhead identification of potential sites and ground verification jointly with Dzongkhags. Coordinate and conduct feasibility studies engaging MSTF members of various Ministries/Agencies. Coordinate and conduct plotting for land allotment and demarcation through cadastral survey. Ensure adequate and timely release of fund for the project activities. Review housing designs prepared by MoWHS and prepare and endorse the quantity of with type of materials and other forms of support for housing. Monitor implementation of the project in line with strategy to maintain uniform standard across the country and ensure timely completion. Promote interventions for improvement livelihood through income generation activities. Evaluate the project activities and facilitate improvements in strategy and implementation. Identification of beneficiaries – inability to absorb all landless and socio economically disadvantaged communities at a time. Identification of sites – adequate land with proper water source, electricity connectivity, soil suitability, etc. For Rehabilitation. Dependence of activities on MSTF members. Skilled labour for house construction. Timely supply of sawn timber. Shifting of beneficiaries to rehabilitation site.